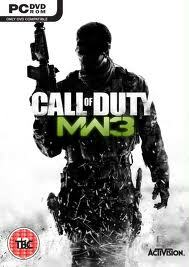 Call of Duty Modern Warfare 3 is finally out! Though the release date was today, it was sold early at some places by accident like Kmart and stolen in mass quantities in places like France. Those lucky people got to play it ahead of time. Whether you preordered it, downloaded it from the Steam client, etc — you’ll be satisfied when playing it after a couple rounds of slaying your friends in multiplayer! It is available on Windows XP / Vista / Windows 7 PCs, Xbox 360, and PlayStation 3 (PS3) consoles. It’s even available on the Nintendo Wii and DS handheld. Though our guide is lacking right now, we will update this as we learn more game fixes for Call of Duty Modern Warfare 3 crashes, freezes, controller issues, failures to launch / black screen, etc. If you know any solutions for game problems that we don’t, please let us know! This first person shooter (FPS) deserves to be played perfectly. Can’t join any matches? No worries — you are not alone. The servers are being swamped right now since the game was just released. The servers are simply overloaded. This will begin to die down as the game loses its initial buzz. Be patient until then or try again a bit later (joining during off hours has an increased rate of success). This error message has been occurring for people who reach level 7 and unlock the Clan Tag capability in the Call Sign Menu. For whatever reason, people cannot enter a lot of different tags. This isn’t happening to everyone, but it is currently unknown as to why you it is happening to only some. While I recommend being careful with your word choice since certain words are denied automatically, it may deny even words or gibberish text that is fine. This will likely be fixed soon though so be patient. It may even be related to the servers being swamped again. Do NOT contact the Activision / Infinity Ward / Sledgehammer Games / Treyarch teams. Wait a couple of days and try again. Do not wait until the 13th though if you have the Hardened Edition, as it does expire. Have Mountain Dew or Game Fuel? You are promised extra points — double in fact — once it is applied to your XBL gamertag. After following the instructions on the case of Mountain Dew you may notice that you are NOT getting double the amount of experience! BOOO! People have reported calling the hotline and having their informaton taken down so that they can be given the points, but as of right now I have not confirmed if this works. Regardless, be sure to enter your code on the rankedup website. Do your textures look like they are low quality, ugly, glitched, fuzzy, etc? There’s a fix for that. Under ADVANCED options select “NATIVE” for image quality. A patch will come out eventually to help solve the actual problem, but this works until then. If you cannot get online, then try the following. Apparently there are many problems with Orange Broadband and Netgear routers. If this is the case for you then update to the NEWEST FIRMWARE! Also, for Netgear (these directions are for DGN1000 model in particular, but easily can be applied to other routers) go to your ADSL settings area and set the multiplexing method so that it’s LLC-BASED. Also be sure to set the DSL Mode to ADSL2+. Thanks Chris Hewitt for posting the link! CoD MW3 has been failing to acknowledge when people have done the daily challenge. Kill counts sometimes aren’t recognized, etc. This may be related to the servers being swamped too. This error is going to be solved soon enough so no worries. You can still beat it though by following the person or to jump in the building that has a broken window (located on the right). If you follow the street, that is when the error is triggered, so avoid it. Is your music / sound / audio messed up for Cod MW3? No problem. The following solutions usually will fix it! Here is the port information for those who must enable ports on their routers, firewalls, etc. or have to forward them. This is good to know if you have the NAT type as strict. This entry was posted	on Tuesday, November 8th, 2011 at 10:27 PM	and is filed under . You can follow any responses to this entry through the RSS 2.0 feed. You can leave a response, or trackback from your own site. Hey guys I was having the orange broadband netgear router problem. I take no credit for this solution but it worked for me. Not of my onlines challenges are completing!!! when i kill people it doesnt count towards it, the only 1 thats working is the basic training challenges! this is doing my head in as im stuck with a standard gun, also my perks wont change… eg i changed my death streak from the sprinting 1 to the know where you killer is on the map and it sticks with the sprinter 1 when im in the match!!! I’m also having the netgear problem but I can’t fix it by changing to LLC-based multiplexing as this disables my access to the internet (also tried changing to “ADSL 2+” rather than “Auto(Multi-mode)”). Any help would be much appreciated. this is seriously crap! i was level 57 in the multiplayer last night, i went to sleep and wake up the following morning and i was put back at level 45, it like i have never reached level 57, all the points and achievements are gone.. ! it happend not only to me but also to friends of mine. The biggest and most serious problem with this game is the excessive LAG and horrible HIT DETECTION. It is actually worse than Black Ops. As it stands now, this game is unplayable. I’ve already had it with this game. Gamers, please do not let Activision and Infinity Ward get away with this. They’ve released a game that is unplayable in multiplayer mode – which is the sole reason most people buy COD games. I’m unloading full clips into people, and not only are they not dying, they’re killing me with one shot (AFTER I’ve unloaded a full clip into them). I’m getting mysteriously shot while hiding around corners, then the kill screen shows my opponent actually walking up to me and shooting me in the face. This is ridiculous. I believe that Activison and Infinity Ward knew this game wasn’t ready, but they released it anyway. This is not acceptable. I won’t be buying any more COD games, nor any other game from Activision or Infinity Ward. They’ve just screwed their entire fanbase. Greg, I am experiencing the same garbage. Horrible hit detection, I empty clips into people and, nothing… then they shoot me, I hear 2 bullets and I’m dead. The killcam shows that they saw me, had about a second to aim, then shot 5-6 times. It’s absolutely terrible. If someone sees me, I’m pretty much dead. The only solid kills I get are the ones when someone is running away, or doesn’t spot me at all. If I meet someone in a hallway and shoot at each other, I lose the battle 80% of the time. This game is absolutely terrible, and I can’t believe I talked so much crap about Black Ops, because this game is no better.. and in many ways, worse. It doesn’t help that people are already hacking this game. Complete garbage. im having trouble in campaign, in scorched earth, when frost gets in the collapsed vuilding, i loose control of him, and starts moving randomly, does anyone know what to do? I have played 5 ffa matches winning all 5. After each game I go to look at lobby leader board to look at the others stats and I noticed my kills haven’t changed in 5 games… wtf? So anyone got a fix for no audio from the center speaker when running in 5.1? I get some echos but dialogue is on the left and right speaker. Surround and center speaker works fine everywhere else but in this game. when i press multiplayer it quits the game !! yesterday when i installed it played ok now cant play multiplayer ! I can get killed instantly as the opponent comes around a corner. When I watch the kill cam he’s 5,6or 7 steps or more past the corner. WTF, it takes all the fun out of the game. Yeh lag is awful . NAT type open : 160 ms ping . NAT type moderate : 70 ms PING . WTF IS THIS ??? i try to get it back to moderate without any succces though… LAG is awful like always. My game crasshes when i try to load “black Tuesday” in campaign or “Toxic paradise in spec ops.! People i have problem with i dont know what if it is game or crack,but when i try to load Scorched Earth i get error always and my game closes,did any1 else have similar problems ? I am having a problem in the Mission “GOALPOST”.While playing a GREY BOX appears with the text “ERROR RELIABLE COMMAND BUFFER OVERFLOW”. If anyone knows what to do to fix the problem please help..! !